I will post any substitutions or performances here. Please check back regularly for updates and "Calendar". I am starting a new Ballet training block. Please sign up by email. I will be teaching at Zofingen 18:45-20.15 on Thursday for 4weeks. I am substituting Pamela Monreale's Ballet class 18:45-20:15 at Zofingen. I am back in profitraining Zürich Tanzhaus, teaching ballet on Tuesday and Thursday 9:30-11:00 for 4weeks! I am looking forward very much. I will be substituting Pamela Monreale's Ballet class 18:45-20:15 at Zofingen. I am substituting Pamela Monreale's Ballet class 18:45-21:15 at Zofingen. If you are close by, come and join us! We make no break during Sportferien, our Tuesday weekly trainings at Bruckenpfeiler take place as usual! Ballet 18:00-19:30 and Contemporary Dance 19:30-21:00. I will be substituting Ballet 18:45-20:15 for Pamela Monreale at Zofingen! I will be teaching profitraining Ballet at Tanzhaus Zurich for 2weeks, Tuesday and Thursday 9:30- 11:00. Let's start again:) Our training every Tuesday at Brückenpfeiler is opened to everybody . Please find out details on "Regular classes" if you are a new comer. 18:00-19:30 Ballet and 19:30-21:00 Contemporary Dance. Happy new year everyone!! I wish you a wonderful year, healthy, energetic, and joyful dancy year!! I thank you all who have worked with me this year! With many new and familiar people, I have enjoyed each projects and love teaching more than ever! I am looking forward 2019 and to see you soon. I will be giving Ballet classes 9:30-11:00 for profitraining Winterthur. I will be giving Ballet class, profitraining Tanzhaus Zurich. This is the last training day for Ballet beginners level. This class will be closed from December on, please join us on weekly openclass Tuesday 18:00-19:30 Ballet Intermediate/Beginners. I will be giving profitraining Ballet at Tanzhaus Zürich. I will be off to Germany performing "Souffle" with DA MOTUS! (Fribourg) at MOVE! Festival Krefeld. My regular ballet classes are cancelled due to other work commitment, thank you for your understanding. Open training (Physical Dance/Contemporary Dance) is cancelled as the studio is not available. Thank you for your understanding! As a member of Company DA MOTUS! (Fribourg) I will be performing "Capunines" at Former Church Les Capucins, Grand-Rue 48, Romont(CH). My regular Ballet classes (Intermediate and beginners) are closed for 2weeks. Back in Basel!! I will be teaching profitraining ballet. I am programmed with Oliver Dähler and Dominique Cardito, site specific performance "Die Mauer" at Galerie Malte Frank for Zuger Kunstnacht and Young Dance Zug. I will be substituting Slawek Bendrat's classes in New Dance Academy. Enough vacations! My regular classes are opening for a new season. I will be substituting Slawek Bendrat's Ballet class, 18:45-20:15 in Zofingen. Summer break for 3weeks, all regular classes are closed. 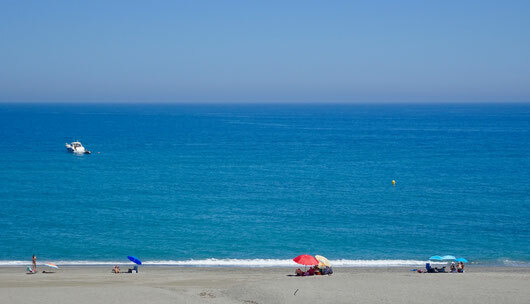 I wish you all wonderful summer time. I will be substitutiong Slawek Bendrat's ballet classes at New Dance Academy. I will substitute following classes for Slawek Bendrat and Tanja Mikahail at New Dance Academy. I will be back in Wintherthur:) Profitraining ballet 9:30-11:00 substitutiong for Oliver Dähler. I'm afraid I have to cancel Ballet class today. Thank you for your understanding. I will substitute Slawek Bendrat's Ballet class at Zofingen. I will substitute Slawek Bendrat's Ballet classes at New Dance Academy. I will be giving profitraining Ballet for 3weeks, Thursday 9:30-11:00 at Winterthur. This is my first time there giving classes, I am looking forward to meet new people and exchange! I will be substituting Stefanie Bolzli's contemporary dance class 19:30-21:00 at Brückenpfeiler. I will be back in Basel profitraining, teaching ballet classes! Thursday 10:00-11:30 and Saturday 11:00-12:30. I will be substituting a few classes for Chera Mack at Unisport. Come to Church! I will be performing at Predigerkirche Zurich on 24th 19:30 and at Berner Münster on 25th 17:00. Regular ballet class for beginners is going to be cancelled. Thank you for your understanding. I will be substituting Abigail Cowen's Ballet classes at Akar Studio in Bern. I am very excited about this project. Currently working on this beautiful piece "Homeland". 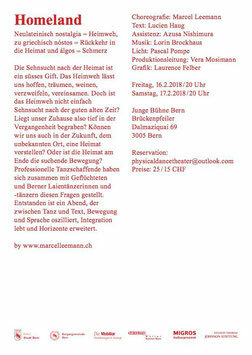 It will be presented on the stage of Brückenpfeiler Bern. Dance and theater, 40 perfromaers on stage, it will be dynamic, energetic, with a lot of touching moments. I am so honered to be part of creating team. I will be giving profitraining Ballet at Tanzhaus Zurich! My regular ballet classes are going to be cancelled. Thank you for your understanding. I will be substituting Abigail Cowen's Ballet classes at Akar Studio. My regular ballet class 18:00-19:30 take place. Let's have first fresh Plies and bend overs for the good start of 2018. More informations on "Regular Classes" for new comers. I thank you all who came to my classes. It has been such a pleasure to teach, always something to discover, in every class and from a great variety of people/bodies/minds. I love what I do and I am so grateful for that. I am looking forward to a fresh start again my regular class on 3rd of January 18:00-19:30. I wish you a happy new year and all the best. I will be giving 3days intensive ballet classes. You can take from one class to 3classes each day. 25.- CHF per day flat fee. @Brückenpfeiler 3rd Floor Tanzraum, Dalmaziquai 69 Bern. No resistration needed. Please just come by! 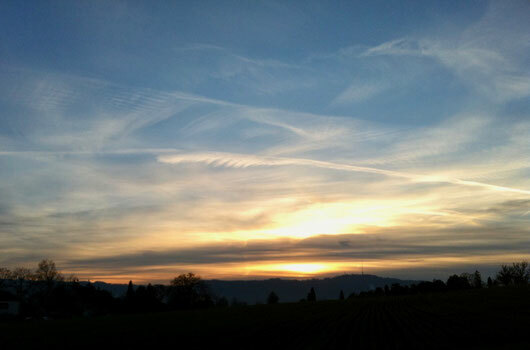 I will ask extra 5.-CHF(1day) and 10.-CHF(2-3days) to support the studio rental. I will be giving ballet classes at profitraining Tanzhaus Zurich. 9:30-11:30 on Tuesday and Thursday regularly for 4weeks! There will be no ballet training in this 2weeks. Physical dance training take place Tuesday 19:30-21:00 as usual. I will be teachingprofitraining Contemporary at Tanzhaus Zurich. 11:00-12:30, right after ballet class! There are a few cancellations of the regular training, please check the calender!! I will be teaching ballet classes for Tanzbüro Basel profitraining again. Looking forward! 11:00-12:30 at Studio Chronos! Join us, each day will be fun, and after all training you will be different! Please feel free to conact me for any questions using the form at the bottom of this page "Kontakt"
I will be performing as a member of DA MOTUS! at Saint- Michael Church in Fribourg, " en orgue" is the coproduction project with the international organ festival. I will be teaching Ballet classes Profitraining Basel. Summer break! There will be no regular training in this period. I wish you all great summer time. I will be performing "Mitohni" as egli_items at 20th Cyprus Contemporary Dance Festival, representing Switzerland! The regular class is cancelled due to the tour performance I am comitted to. Thank you for understanding. I will be guest teaching at Cinevox Junior Company Neuhausen. 10:00-11:30 Contemporary training. Looking forward the young energy and motivation! I will be substituting Ballet class in Zofingen. I will be performing "Practice Paradise" by Oliver Dähler at Kulturtage'17 in Thalwil. Regular trainings are cancelled this week due to performances in Thalwil I perform. Thank you for understanding. I will be back at Tanzhaus Zürich givining profi Ballet training! Tanzfest all over SwitzerIand! I will be performing "Souffle" by DA MOTUS! in Winterthur and Lugano. All training at Brückenpfeiler Bern start again. Looking forward to see you in the studio. Please check the calendar regularlly. All trainings at Brückenpfeiler Bern are closed during Spring holiday. I will be teaching ballet classes at Profitraining Basel. Regular classes are cancelled this week. Please check the calendar for detail. As a member of egli_items company I have performances in the beautiful chapel of Helferei in Zurich, Revival of "Mitohni" (Premiere May 2016). *Normally all regular trainings are closed during holidays. I will be teaching at profitraining Zurich Tanzhaus, ballet classes on Tuesday and Thursday 9:30-11:00. There will be no training by me during Winter holiday. Regular classes 2017 start on 11.01 Wednesday 18:00-19:15 and 13.01 Friday 18:00-19:30. I will be teaching ballet classes at Profitraining in Basel. I will be teaching Profitraining (Ballet) at Zürich Tanzhaus. I will be substituting ballet classes at New Dance Academy Bern. Regular classes start again! Looking forward to seeing you in the studio. 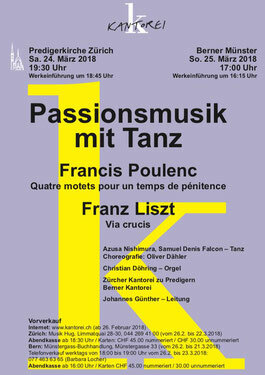 I have performances in Fribourg with DA MOTUS! There will be no training at Brückenpfeiler during Herbstferien. Regular lessons on Wednesday and Friday are moved to Saturday. Please check the calender for details. I will be substituting ballet classes at New Dance Academy Bern for 3 weeks. I will be substituting classes at Zofingen. I am offering an intensive ballet course, beginner level. Location: Brückenpfeiler 3rd floor, Dalmaziquai 69. Bern.